VO Outreach Coordinator Rachel Shippee has been to 93 schools this semester, handing out more than 59,000 booklets! Rachel was the most prolific leafleter last fall, and since the spring of 2009 she has placed booklets into the hands of over 145,000 people! Rachel at Oklahoma State, where she and Hayley Chaffin handed out 2,500 Compassionate Choices on 2/13/14. 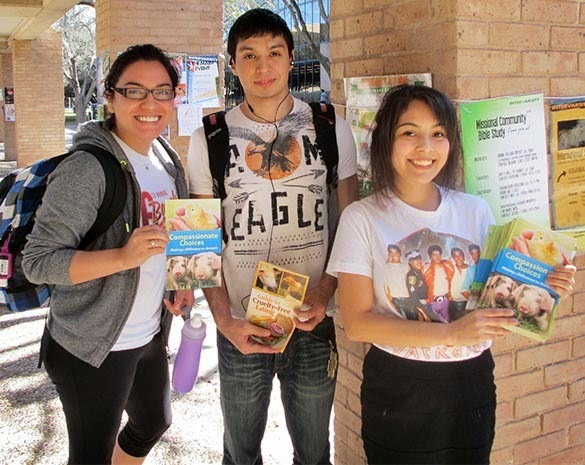 Suzeii (right) with two UTPA students interested in going veg and joining the campus AR club! UWRF students: a vegan who now wants to become a leafleter, a vegetarian, and a woman who now wants to go veg! You can show Rachel some love and help spread veganism by visiting her Team Vegan page here.